that if Abram Vandegrift aforesaid and Miss Emma Cleaver may lawfully unite themselves in marriage, and if there be no legal objection to celebrating the rites of marriage between them, then this obligation shall be void, otherwise to be and remain in force. It seems similar to "banns of marriage", but it's significantly different, particularly in the mention of $200 (which was a great deal of money back then). I've never heard of a document like this. Was its use common and widespread? And given the date of January 1, 1883, what can I assume about when they were actually married? That looks to me like a Marriage Bond, posted by the groom and a relative of the bride, (two parties who could be expected to know the truth) to testify that there is no legal or moral impediment to a marriage. The $200 would be forfeit (to pay legal costs?) if the marriage didn't take place or was subsequently nullified. Some of these documents were annotated to show the date of the actual marriage (typically within a few days), although this didn't always happen, so the absence of any annotation didn't mean the marriage didn't take place. 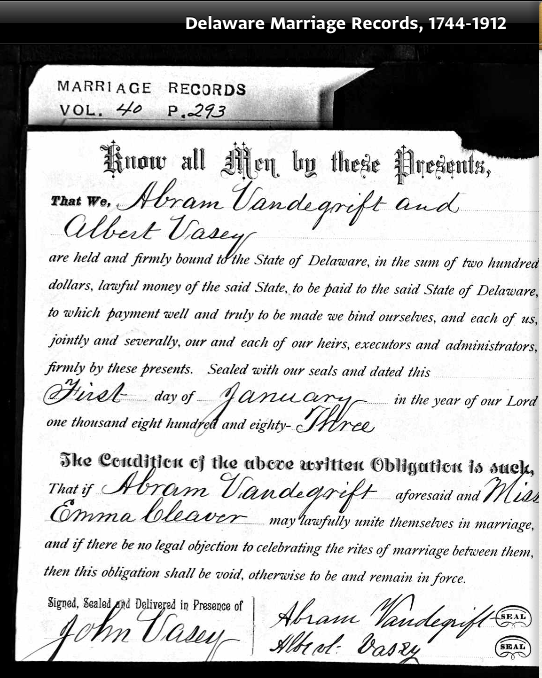 I believe this is what was known as a Marriage Bond and Albert Vasey is presumably the bondsman, or surety. Most sources seem to suggest that the bondsman was usually a close relative, so you may find Albert Vasey to be a useful lead to pursue. This looks like a standard marriage bond. No money changed hands at the time of signing the bond, but the bondsman (usually a relative of the groom) would be held responsible for legal costs if the groom was sued for violating the terms of the marriage contract. As others have mentioned, the bond was to ensure that the prospective groom had the legal right to marry the prospective bride, that is, he was of age, not already married, and of an appropriate degree of consanguinity, if related. Generally, marriage bonds were required when a groom was not well known to the bride's family. They were designed to offer legal protection to the bride in the event that the groom misrepresented himself. Not the answer you're looking for? Browse other questions tagged united-states 19th-century marriage-records or ask your own question. Minimum age to be mentioned in a will? Does a mother signing a Marriage Contract imply the father is dead? Reading words on old document relating to share of Will?